Fifth in his class, George M. Edgar graduated from Virginia Military Institute in 1856 and became an assistant professor at his alma mater. In 1859, he accepted a professorship in natural philosophy and astronomy at the North Carolina Military Institute and later taught at Florida State Seminary. During the Civil War, he served in the Confederate Army, rising to the rank of lieutenant colonel. After the war he studied mathematics, physics and chemistry at the University of Virginia and accepted the chair of mathematics at Oakland College in Mississippi. He later conducted schools across Kentucky. 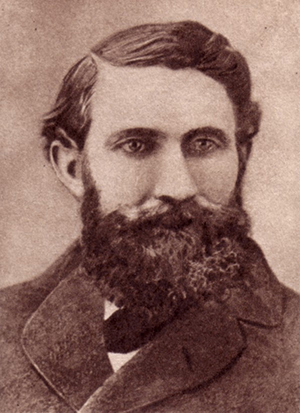 In 1884, at a time when there was bitter controversy among the university faculty, Edgar was elected president of Arkansas Industrial University. His early efforts to administer the university were only partly successful. The byword of Edgar’s administration was “regulations.” A committee appointed by him issued a booklet with 85 regulations, among them the prohibition of female students to receive “attentions from young men, whether connected with the university or not;” discouragement of the use of tobacco as an “injurious habit”; and submission of all examination papers to the president, “for his information and approval,” at least one day prior to the examination. Whatever Edgar’s difficulties with the faculty, the Arkansas General Assembly voted to reorganize the university, sweep out the current faculty and give the president a new corps of instructors. If helped in the first instance, Edgar’s administration was undermined by the next General Assembly, which voted to reorganize the agricultural and industrial lines of the university. Edgar opposed the legislation and resigned in 1887. He later served as president of West Florida Seminary, now named Florida State Seminary, and then taught at the University of Alabama and Occidental College in California. Personal: Edgar was born March 1, 1837, at Union, Va. He married Rebecca Fry, and they had six children. Edgar died Oct. 18, 1913, at Paris, Ky.